On the verge of summer (except something seems to have gone wrong this year) the fresh young leaves from grapevines are easily and cheaply available in many markets. Go buy a few bunches and experiment with something that makes a handy healthy starter or indeed a main course. Vary flavorings like lemon and pomegranate molasses, mint for parsley and chilli for cinnamon to journey plate by plate all over the Balkans and the Middle East. Indeed one of my most memorable stuffed vine leave experiences was in Istanbul when I filled them with some leftover artichoke and baby fava bean and champagne risotto mix. The risotto in question is still one of my favorites – tiny fava beans (broad beans) and the season’s first artichoke hearts cleaned and placed in acidulated water by the neighborhood artichoke seller. It was only natural that they made delicious stuffed vine leaves. That’s really the point with vine leaves – let the imagination run riot with all manner of fillings. The method may seem a bit tricky at first and my Turkish teachers gave me many tips and strict rules regarding raw rice and pre-cooked rice, the type of occasion suitable for vegetarian vine leaves (cold as appetizers for guests) and when to serve meat ones (warm and served with yoghurt) but actually there is nothing to the method. Just allow yourself some slow food time, find a friend and immerse yourselves in the strangely hypnotic and reassuring repeated movements of shaping the little green parcels. Down on the Aegean coast of Turkey, they fill the vegetarian ones with rice and a small fruit known as a “bird grape” that is somehow like a very small raisin. Years of Greek influence mean they are flavored with cinnamon and then simmered with a generous dose of olive oil in the water so that the parcels emerge shiny after having absorbed the oil. I have also eaten very fine foi de vita (vine leaves) stuffed with veal and served with smantana in Romania. Of course the Greeks have their vine leaf dishes and I have made them with fresh mint and served with that classic Greek combo of eggy lemony sauce that uses the same process as Avgolemono. Any way you make them, they will be delicious. You need: A large wide saucepan and a generous dose of patience. This makes approximately 50 vine leaves. Sauté the onions in olive oil, on low for 15 minutes. Add the rice and sauté for another 15 minutes over a low heat. Add the nuts and currants and sauté for 5 more minutes. Add the spices, mix. Add the water and put the heat on medium; when it begins to boil (in about 5 minutes) turn the heat down for 10 minutes. Turn the heat off and let it cool for at least 2 hours. Blanche in boiling water three to four leaves at a time. I.e. just immerse them in boiling water until they wilt and change color – 1-2 minutes. This makes them much more pliable to fill. Place each leaf on a wooden board shiny side down with its stem toward you. 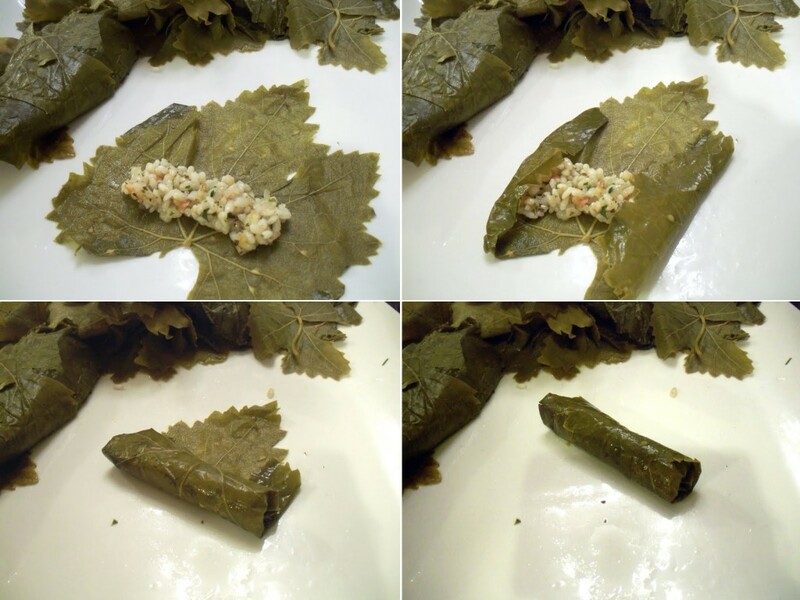 Put a teaspoon of the filling near the bottom of the leaf, fold the bottom and 2 sides to cover the filling, and roll tightly toward the tip of the leaf. Give it a gentle squeeze to stick the leaf tip to the body of the rolled vine leaf. Line the saucepan with a layer of leaves to stop them sticking. Fill the saucepan with the vine leaves. Put a plate above the vine leaves and pour 500ml water over it, close the lid and cook for about 1 hour after it boils. Check the pan after 40 minutes to check if more water is needed. Eat cool, drizzled with a little olive oil and with a glass of something nice and cold too. Rachel Sargent is the chef and owner of the London Street Bakery, which offers healthy seasonal food. More about it here.